It's a fess up post here...one to celebrate the shoes I never wear. I'll start with explaining that I come from a family where shoe addiction is rife. Where shoes are bought regardless of occasion or comfort - but purely because it would be wrong not to and mostly because they're in a sale of some sort. Since marrying my parsimonious husband and moving further from the shoe addicted siblings and mother, I've definitely curbed the buying but I'm a still a sucker for a good shoe sale and have always had a decent collection of shoes I never wear. Yup - NEVER! So when we came to move house in December, there was a massive shoe cull...between my back issues and the fact that we were moving to a smaller house with less shoe storage, I consigned and charity shopped about 30% of my footwear - mostly the high or uncomfortable ones. But believe it or not, I *still* have shoes I never wear. I'm sure you do too - in a straw poll of my friends, everyone admitted to at least 1 pair they can't bear to part with. 1 Next Leopard Mid Heel Courts. Loved these when I bought them but I got a negative comment on the blog when I wore them once and it put me off them...you think I'd be wiser to that by now but clearly I'm not. 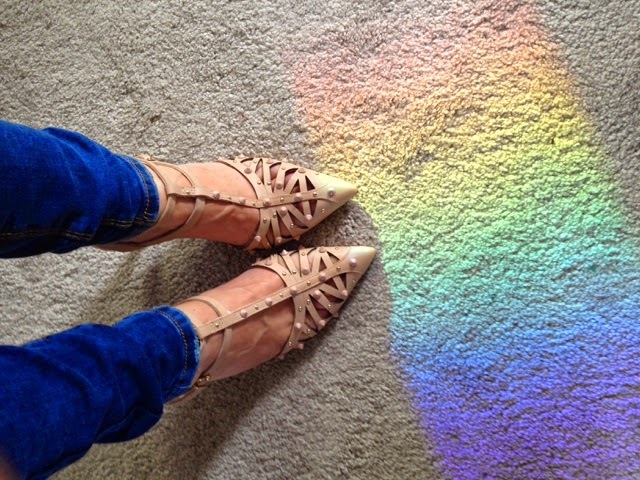 2 Boden Pointed Flats - I obsessed over these and watched them like a hawk until they were well reduced at the end of the season. Bought them, wore them once and that was it. They're too narrow for my foot and I have very little blue in my wardrobe so I struggled to match them. 3 River Island Tan Strappy Heels - Look amazing, are actually quite on trend at the moment but they are too high, too narrow and too small for me. Sale purchase gone wrong...I might have had lunch with a drink before I bought them. 4. Hobbs NW3 leather loafers - no idea why I don't wear these. The heel is a bit of an untrendy height but these are beautifully made - leather lined, leather soled & uppered, so I can't bear to part with them. I will wear them before the week is out - I promise. Finishing with the ones I'm wearing - the Coast Valentino copies. These - I love to look at. Bought when my back was at its worst and I couldn't even manoeuvre my foot into them. I think they were a kind of therapy for me at that time. Once I was able for heels again, I attempted to wear them to an event and couldn't walk for a week afterwards. Hell on Heels...but how freaking gorgeous are they? I'm allowed one pair to look at surely and I think the girls would enjoy them when they're older...and look - a rainbow appeared on the floor when I put them on. It's a sign!! So I'm selling the first 3 (LEOPARD ALREADY SOLD! ), keeping the last 2. Full details on my wardrobe sale shop page on this link. Love, love, love the Coast ones. I have been hunting eBay for months. So beautiful. You know I have the Coast shoes too - I carried them all the way to Spain and back last year and I have still never worn them! I can't bear to part with them though! You are hiliarious ... love the rainbow 'sign' to keep the shoes. But you're not alone! I actually finally gave away two pairs of stilettos that I never, ever wore just a few weeks ago. I'm sure if I search some more, there would be quite a few other pairs as well. Why do we do it?? I found a tan pair of gladiator heels that I bought YEARS ago & they still have the tags on. But after trying them again, I will wear them so they're keepers! 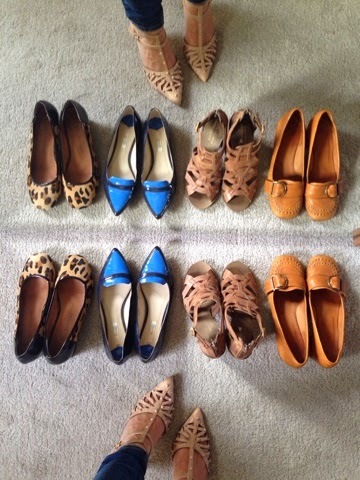 Along with 7 pairs of shoes that I've only ever worn once - I need to eBay them! I keep shoes until they either fall apart or they walk of their own accord. I do not, ever throw shoes out - ever!! !